2009 Honda Civic Sdn MANAGER SPECIAL !! ITS READY TO HIT THE ROAD !! Trim:MANAGER SPECIAL !! ITS READY TO HIT THE ROAD !! 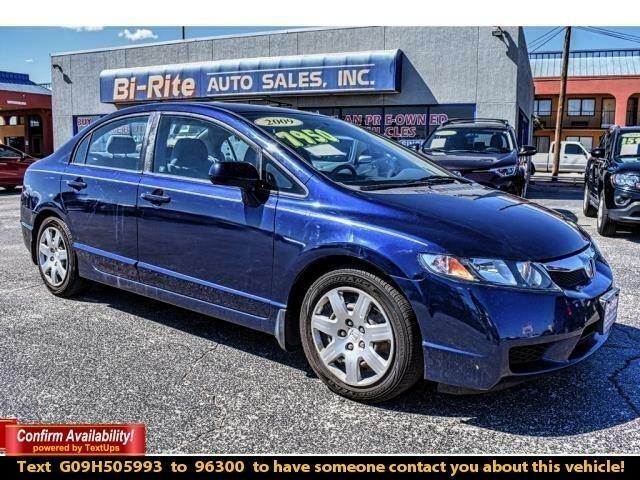 Efficient, stylish, and safe it's easy to see why our 2009 Blue Honda Civic LX Sedan has been in production for more than 30 years. Powered by a 1.8 Liter 4 Cylinder generating 140hp mated to a 5 Speed Automatic transmission. This Front Wheel Drive has more than enough power in all situations as it secures nearly 36mpg on the open road. Polished steel wheels and curvy lines on this sedan will keep you turning heads for years to come. Inside this LX, the controls are intuitive and impressively well-placed. You'll appreciate the comfortable cloth seating, leather-wrapped steering wheel with cruise control at your fingertips, AM/FM stereo/CD player with MP3 decoder, power accessories, and more. You aren't going to regret adding this sleek Civic sedan to your parking spot! The IIHS gave this Honda its top rating of Good for front, side, and rear impacts. Add in daytime running lights, Advanced Compatibility Engineering, four-wheel ABS, and a tire pressure monitor, you won't ever need to worry again. With a reputation for quality, reliability, and an over-all fun quotient, this Honda Civic LX is the car for you! Print this page and call us Now... We Know You Will Enjoy Your Test Drive Towards Ownership! Please call us for more information. Vehicle Inquiry for 2009 Honda Civic Sdn MANAGER SPECIAL !! ITS READY TO HIT THE ROAD !! Trim: MANAGER SPECIAL !! ITS READY TO HIT THE ROAD ! !